Jim is a native of Woodbury, N.Y. and a graduate of St. Dominic High School in Oyster Bay, N.Y., Jim earned his Bachelor of Science Degree from STAC in 1999. He received his Master’s Degree in Social Studies Education from NYU in 2003. Additionally, he received his Master of Science in Education (Educational Leadership) from St. Thomas Aquinas College in 2016. Jim’s dad is a native of Dublin, Ireland (Clonliffe) and his grandparents were from Dublin and Kildare (Maynooth). Upon graduation from STAC, Jim served as the first assistant director of Alumni Affairs and Annual Giving at the College. In 2001, he began his teaching career in the NYC Board of Education at M.S. 80 in the Norwood section of the Bronx. While at M.S. 80, Jim served on the School Leadership Team (as Chairperson), the school’s grant writer (he secured a grant from the 3M foundation for the School’s Library Media Center), Report Card Coordinator (5 years) and finally served as the Dean. In 2006, Jim left M.S. 80 and began teaching at Clarkstown South High School in West Nyack, N.Y. He has taught the following at Clarkstown South: A.P. U.S. Government and Politics, U.S. History, International Baccalaureate, Years 1 & 2, and Syracuse University Project Advance course in Public Policy. Jim is currently on the Site based team; coordinator of the school’s blood drives, Junior Class Advisor and is the advisor of the National Honor Society. He is involved in the Clarkstown Teachers Association as a building rep and served as Chairperson of the Political Action Committee. Since 1998, Jim has served as Parish Youth Minister at St. Francis of Assisi Church in West Nyack, N.Y. During his time at St. Francis, the Youth Group became one of the largest in the Archdiocese of New York. The parish was awarded the CYO/TAF Apostolic award in 2004 and Jim was awarded the Youth Ministry Award in 2006. Since Jim arrived at St. Thomas Aquinas College in 1995, he has been involved in campus activities. While a student, Jim was elected the freshman and sophomore class president, Student Government President for two years, served as a student member of the Student Affairs Committee of the Board of Trustees, and also had a radio program on WSTK. For his service to STAC, Jim was awarded the Terence Cardinal Cooke Award at Commencement in 1999. Jim also has served on the STAC Alumni Association Board of Directors and was elected its Vice President in 2010. Off-campus, Jim has been involved in the following: Member, Board of Trustees, Historical Society of Rockland County, Past and current chairperson of the Rockland County Youth Bureau and past secretary of the board and board member of Thorpe Family Residence, a homeless shelter for women and children located in the Bronx. Jim is also a Sparkill Dominican Associate. Jim joined Division 1 North Rockland in 1999 and immediately became involved in the division. 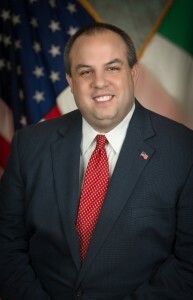 He has served as Secretary, Vice President and President of the Division. On the county level, Jim has served as Scholarship Chairperson, Secretary, Treasurer, Vice President and until most recently County President since 2013. Jim also served as Co-Chair for the 1st two halfway to St. Patrick’s Day Parade fundraisers for two years that raised in excess of $20,000, Parade Mass and Breakfast Chairperson, he has also been involved in the Feis as the Mass Chairperson. He was also Mass chairperson for the extremely successful 2011 State Convention that was held in Pearl River. On the state level, Jim is the chairperson of the New York State Scholarship Committee. He has also been a member of the committee that coordinated the national dinners’ for Past National President, Brendan Moore. Jim is a member of the CMAO (Concerned Member Affiliate Organization). This organization is trying to bring democracy back to the parade and having the parade board recognize the affiliate organizations. Unbeknownst to Jim, his paternal grandmother’s uncle was involved in the rising in 1916. Jim and his wife Tricia were married on August 29, 2009. They have an almost 5-year-old daughter, Annie who is the light of their lives!